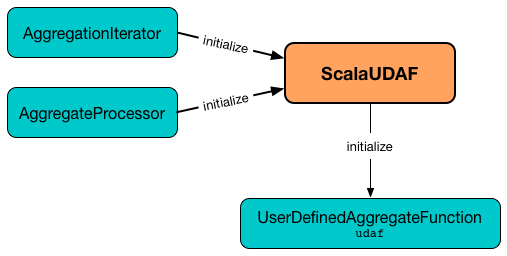 ScalaUDAF is a Catalyst expression adapter to manage the lifecycle of UserDefinedAggregateFunction and hook it in Spark SQL’s Catalyst execution path. ScalaUDAF has no representation in SQL. ScalaUDAF initializes the internal registries and counters. initialize sets the input buffer internal binary row as underlyingBuffer of MutableAggregationBufferImpl and requests the UserDefinedAggregateFunction to initialize (with the MutableAggregationBufferImpl). initialize is part of ImperativeAggregate Contract. update sets the input buffer internal binary row as underlyingBuffer of MutableAggregationBufferImpl and requests the UserDefinedAggregateFunction to update. update uses inputProjection on the input input and converts it using inputToScalaConverters. update is part of ImperativeAggregate Contract. merge then requests the UserDefinedAggregateFunction to merge (passing in the MutableAggregationBufferImpl and InputAggregationBuffer). merge is part of ImperativeAggregate Contract.